Secret Sphere always has been a steady factor in the Italian progressive/ power metal scene over the last twenty years. Releasing solid albums and creating an unique sound which gave them their recognizable touch. A few years ago in 2012 the change of vocalists gave Secret Sphere a new impulse and the experienced Michele Luppi was the person to take the next step upon the crowded musical ladder. It also meant the band was taking a step away from the more traditional theatrical power metal, that brought fame to a lot of Italian bands those days. Michele Luppi brought in a very melodic voice; much more towards the melodic rock and even AOR style. In the end this was a bold decision, but still the step necessary to move on, up the aforementioned ladder. Since the previous album; a live registration of their Tokyo concert; One Night In Tokyo (2016, see review), the band underwent a minor change. Guitarist Marco Pastorino is no longer present and leaves band leader and guitar player Aldo Lonobile behind to take care of all the guitar duties on The Nature Of Time. Bass player Andy Buratto has been accompanying Aldo from the early beginning in 1997 and became a very steady factor for the band, but also keyboardist Gabriele Ciaccia has been present quite a while already; since 2009. Only drummer Marco Lazzarini came to reinforce the band in 2013. After a short instrumental, spherical opener; Intermission, Secret Sphere kicks off with a nice progressive, but melodic track. The Calling sees a lot of tough progressive rock elements, nice keyboard parts, adventurous guitar parts and a solid, but playful rhythm section. But it's Luppi's voice, including the slightly bombastic choirs, all sung by Luppi, that gives Secret Sphere their renewed distinguished sound. After this fine opener Love takes a step back and becomes a showcase for the fine vocal parts. This track is closer to melodic rock as to progressive metal, but the fine guitar solo and defined keyboards bring balance between both styles. Marco's haunting drums lead in Courage, which shows a bit of the power metal. More speed, more power, but again brought in perfect balance by the melodic vocal parts. Check the instrumental break on this tune and both guitar lovers as well as keyboard aficionados will get some of their likings. Kindness returns to the melodic part as a beautiful ballad, filled with gentle guitars and a fine spherical solo. With Honesty the power is turned up again, trashy guitar parts go hand in hand with some of the nastiest vocal parts by Luppi. The tempo change in the middle adds a nice special touch and the multiple layers of vocals does add the additional cherry, so does the bombastic theatrical end of the song. Both Faith and Reliance are powerful tracks, where the middle parts show Luppi's crafts, with Reliance adding an amazing instrumental part. More power, more speed; the instrumental Commitment starts really heavy, but gently a jazzy influence appears as a wonderful bass versus keyboard part begins, Aldo's guitar solo finishes this one as one of my preferred tracks of the album; in a way this is the most progressive rock tune on the album. Close to nine minutes lasts The Awakening, nicely dosed power metal, where guitar and keys are in perfect balance and Ciaccia proves he is a great keyboard player. When the album come to an end, The New Beginning is the final chance to enjoy both Luppi's great voice as well as Lonobile's perfect guitar playing. 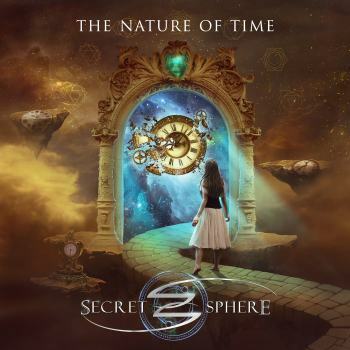 With The Nature Of Time, Secret Sphere closes the bridge between power metal and melodic rock. The band takes the best of both worlds and meet you at the middle. Musically very interesting and brought by some amazing musicians. Guess “push repeat” is recommended.